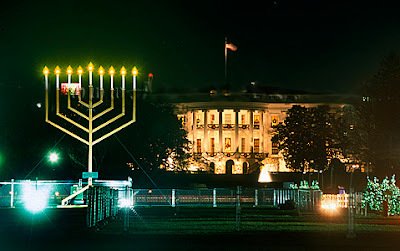 Maurice Pinay: Everything's Kosher in Washington D.C.
G. W. Bush sez: "The Talmud instructs families to place the menorah in public view -- so the entire world can see its light." The menorah prominently displayed at the front White House gate speaks volumes: Bottom line: The Jews control our president and his people. It is an in-your-face symbol informing us, in a rather stident manner, that our country has been thoroughly Judaized.